Rainbow Riders is always looking for more volunteers to help with their incredible cause. If you are interested in helping out in any way, please contact Rainbow Riders. You can call the office at: (309)-734-4849 or come out to the office, which is located at: 822 200th Avenue, Monmouth, IL 61462. Learn more about helping out and Rainbow Riders in general by visiting rainbowridershome.org. 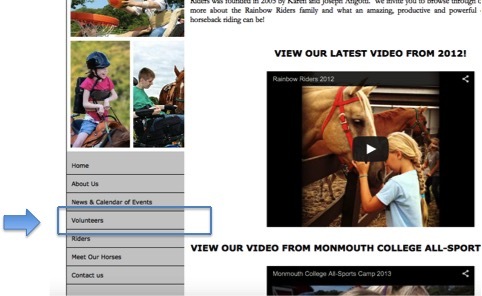 To become involved as a volunteer at Rainbow Riders, go to www.rainbowridershome.org and click on the volunteers section, as shown in the image above. Any further information or resources needed can be found here.